The memories we have of our lives are not a continuous narrative. Instead, they are more akin to the several arcs of a skipping stone—three, four, five, six splashes and onward. Flash nonfiction is in many ways an ideal form to capture the world of those splashes of memory, fueled by the energy of the previous arc’s path descending into the water, as well as, at the end of the brief essay, the energy urging up to the curve of another arc. In this way of thinking, a flash nonfiction piece doesn’t have a beginning so much as a point of entry, and a point of departure rather than an ending. In much the same way poetry employs negative space, a flash nonfiction piece can imply and silently give shape to its before and after. Yet few of us possess photographic memories. If anything, as the days, months, and years pass, we suffer a reversal of those ancient self-developing Polaroid photos: our memories start out clear, and then fade into ghostly wisps. How is it possible to adequately recall the Technicolor details? I doubt it too, but memories don’t have to be exact in every detail to contain an emotional truth. The trick is to recapture the details that point to those truths. When my wife, the anthropologist Alma Gottlieb, and I wrote our first memoir of Africa, Parallel Worlds, some of the events we recounted were more than ten years in the past. In many ways, this was a necessary waiting period. The complexities of living in the culture of West African rural life required a “cooling off period” that enabled us to remember not only specific details, but the significance behind those details. When we recently completed our second volume of the memoir, Braided Worlds, we wrote of some events that went back twenty years or more. Yet, somehow, many of those memories seemed clearer to us than yesterday’s goings and comings because of the emotional intensity of what we chose to write about. Intensity is even more essential in flash nonfiction, where brevity must be balanced by the gripping necessity to speak. Memories can also lay dormant, waiting for when you are finally able to remember. One summer residency at the Vermont College of Fine Arts, I sat in the audience while my colleague Sue William Silverman presented her lecture on flash nonfiction. She included a writing exercise, asking us to write about something we’d never written about before. After a few initial scribbles I was nine years old again: 1960, back in the kitchen of my parents’ home, on what must have been a Saturday morning, trying to eat my cereal at the circular breakfast table while listening to my mother and father’s latest verbal donnybrook. They argued constantly. The last time I ever spoke with my father, by phone, he was balancing our conversation with a dispute he was conducting with my mother in the background. But of all those arguments, I can’t remember a detailed exchange, just the white static of their anger. At this, my father left the kitchen. But he returned in seconds, livid, shouting, “Don’t you ever, ever say that again!” while my mother faced him unmoved, and began laughing. Why are these the only actual words I remember of the near infinitude of my parents’ arguments? Sue’s writing exercise had led me to this unexpected question, and to an answer that further surprised me. I have no doubt that I heard those exact words (or nearly so), even if I didn’t realize their true import beyond the heady fear that my parents’ marriage had entered dangerous new territory. Yet that angry exchange must have taught me who loved whom more, who loved less, and who had the most power because of that. Loving more was a dangerous weakness that could open you up to humiliation. But I also learned that loving less was no less dangerous, that it could turn you cold and vindictive. When it came to love, I didn’t want to be like either of my parents. But I had internalized this dilemma without knowing I’d done so, and in my teen years and beyond I brought a hesitance to any possible relationship, a wall of caution I didn’t quite understand. Still, I had remembered the words my parents exchanged; they were waiting for me to listen to them again, saved inside for a reason. As Hemley says, writing down memories makes them more real. Fifty years after that argument a single flash nonfiction exercise offered a greater understanding of what eventually attracted me to the young woman who would later become my wife, a revelation that helped me realize how the carefully calibrated and sometimes contentious balance of our affections has held us together. How strange—my mind had known the few words I’d need to remember, in order to one day comprehend their long term effect on me. How I wish I’d looked more closely, far sooner. This is what the intensity of writing flash nonfiction can offer: a vivid rather than a casual remembrance. Memories aren’t merely simple events easily recalled. The skipping stone of memory lands on a particular place on the lake for a reason, and then ricochets off in a different direction for another reason, and the mystery of those invisible arcs are embedded in the details of the memory left behind. Yet any significance within the details might not reveal itself easily, or it remains there in full light yet isn’t ready to be seen. A certain relentless patience, applied to the page, may be all you need. I recently came upon an arresting image, taken by Adam Gormley, an Australian photographer. He had been photographing spider webs when a rainstorm hit, and in the aftermath, he captured an image of an ant trapped within a three-millimeter drop of rain whose surface tension maintained the shape of a sphere. 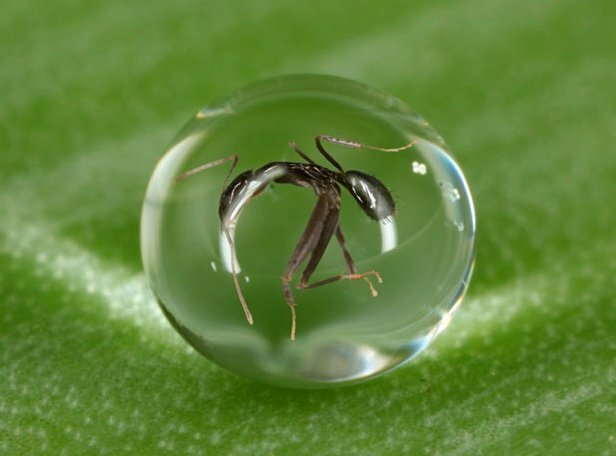 Floating in the middle of that transparent pearl, the reddish-brown body of the ant hunches, its many legs dangling toward the bottom of the raindrop’s curve. Gormley at first thought there was a piece of dirt in the droplet; only when he looked closer did he see the ant. “I shouted out in excitement when I realized what I’d captured by accident!” he said. Why we remember something is not always immediately obvious: within certain memories lies something hidden, the equivalent of a floating ant. How to find it? James Elkins, in the introduction to his book How to Use Your Eyes, writes, “Our eyes are far too good for us. They show us so much that we can’t take it all in, so we shut out most of the world, and try to look at things as briskly and efficiently as possible.” Too often we skim over our memories as well. They become stories we’ve told ourselves for so long that we think we don’t need to revisit them in greater detail. Yet, as Elkins writes further, “It’s about stopping and taking the time, simply, to look, and keep looking, until the details of the world slowly reveal themselves.” The irony here is that a writer needs to slow down in order to create something as swift and intense as a flash nonfiction essay. Think of a memory, even a familiar one that you haven’t looked at closely in a long time: the lie you once told, the one whose memory you still flinch from; a conversation or argument you were part of or overheard that you’ve saved in memory but aren’t sure why; or a fraught incident from your childhood that you can’t seem to relinquish. While I admire Debra Marquart’s flash nonfiction “Hochzeit” because it features accordions and a vivid memory of a polka dance, I especially like the moment when it seems to lift off the floor. The piece begins with a quick image of the author’s parents dancing, then moves away, offering a wider view of the long-ago celebrations. But then the essay returns to the parents in more detail, and something of the joy of their movement captures beautifully Marquart’s evocation of her younger self, seeing them “hold tight, their young, slim bodies enjoying the thrill of spinning out while being held in.” One brief moment that seems to define a relationship. “Hochzeit” first appeared in Brevity (Issue 14, Fall 2003) and in The Horizontal World: Growing Up Wild in the Middle of Nowhere by Debra Marquart (Counterpoint, 2006). Philip Graham is the author of seven books of prose poetry, fiction, and nonfiction. His nonfiction includes The Moon, Come to Earth: Dispatches from Lisbon (2009), and two co-authored (with Alma Gottlieb) memoirs of Africa, Parallel Worlds (1994) and Braided Worlds (2012). Graham’s nonfiction has appeared in The New York Times, Washington Post Magazine, McSweeney’s, Mid-American Review, and The Millions. He teaches at the University of Illinois, Urbana-Champaign, and the Vermont College of Fine Arts. A co-founder of the literary/arts journal Ninth Letter, he currently serves as the magazine’s nonfiction editor. His short essays on the craft of writing can be read at www.philipgraham.net. How strange—my mind had known the few words I’d need to remember, in order to one day comprehend their long term effect on me. How I wish I’d looked more closely, far sooner. ” — Yes.